The Polar Express is an arcade adventure game, linked with the animated film of the same name. As you’d expect, they’ve employed a good few of the actors from the film including Jim Hanks (Tom Hanks’ brother), Daryl Sabara (Spy Kids) and Nona Gaye (The Matrix movies). Some of the animated cut-scenes are taken directly from the film. This game is clearly aimed at people much younger than me, so I’ve asked Purple Bear (my 10-year old daughter) for some comments. Her comments are in bold italic text at the end of the review. I wouldn’t say there is much of a plot to this game. I would say it has a premise: boy doubts existence of Santa Claus, magical train (the eponymous Polar Express) shows up to take him to find Santa at North Pole. But beyond that, the rest of the game is about the adventures of ‘Hero Boy’ – they never even give him a name, nor any of the other children, for that matter. Though having said there’s no plot, most of the puzzles do appear to tell aspects of the story of the film, as far as I can tell, not having seen the film. The first half of the game takes place on the Polar Express itself; the second half, at the North Pole – or at least, the story-teller’s version of how the North Pole looks. Of course, as we’re dealing with the modern version of Santa Claus, the North Pole consists of an enormous city and factory that is populated by elves, presents and lots of machinery. This game is played in the third person, with keyboard controls. That’s not as bad as it sounds, as there are only nine controls – movement, primary and secondary actions, jump and a perspective switch – you can flip the camera to face Hero Boy in most situations. This perspective switch comes in handy on several of the games where you have to traverse a train carriage in one direction and then return to where you started. Without wishing to spoil any surprises, the games consist of simple avoidance tasks, throwing games (including a food fight! ), a game like “Simple Simon Says”, a ski race, and so on. You even get to control a zeppelin and a runaway train carriage; well, I say control, but… well, you’ll find out what I mean. The only game I found difficult was an old-style platform game section, where you’re making your way up a mountain of gifts, with jumps, moving platforms, swinging ribbons, extra bouncy toy boxes, and bouncing presents as hazards. If it hadn’t been for this section, I doubt the basic game would have lasted more than 3 hours for me. To complete the whole game, rather than just playing through the sections, you need to find the hidden toy pieces. These unlock eight items of additional content – movie excerpts, music, and access to some of the mini games in a form that can be played for points or against the clock. Those games have high-score tables too. Every mini game is introduced by simple instructions, so that there’s rarely any doubts as to what you need to do. Initially, I was concerned about the stability of this game – the introductory movie causes a crash-to-desktop every time I play it (in exactly the same spot every time), but apart from this, the game was very stable, with just a few graphical and audio græmlins from time to time. The most novel of the mini games, as far as I was concerned, was the Simple Simon Says game. In each instance (it’s used twice), you have to imitate the moves of another character to achieve a task, rather like a dance. There are only six controls used in this, so it’s not too difficult. Well, that was fun, wasn’t it? After less than five hours the game is complete! This might explain why this review is also quite short. Okay, I admit it; my reactions are excellent, as after all, I am an amateur juggler in another existence. So this kind of simple arcade stuff comes quite easily. Even so, I found this game fun, in the most part – it was only the platform-game-like section on the toy pile that I found frustrating. I never was much good at those games. The game was stable (apart from the reproducible crash-to-desktop during the introductory movie, which was a shame), and mostly bug free, though there were some stuttery sound effects and graphical glitches. 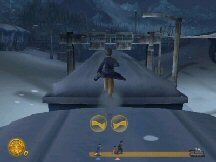 The Polar Express has a surprising degree of replayability – this is probably down to the simple fun that can be had from the sections; once you’ve completed the game, you can go back into any chapter and play just a part of the game. The only thing stopping me from grading this game higher are those glitches and the length of the game. The Polar Express is a very fun game with all the different challenges to do. It was hard at times. Some challenges took a bit more time to do than others, like the rooftop chase. I like to go back to some bits of the game because it is so good. I think the game should be aimed to 9+ because my 8-year-old sister had quite a bit of trouble on some bits she tried. And I can't wait to see the movie. · nVidia GeForce 2 or better with 32 MB of Video RAM.